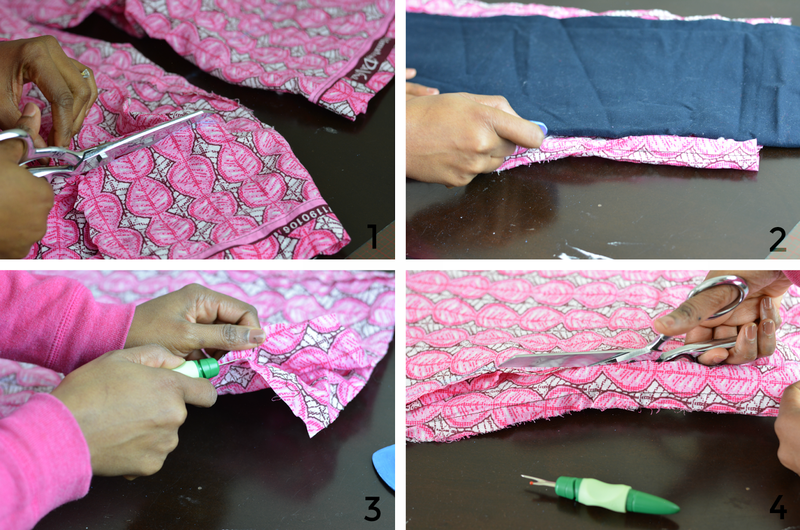 I have been wanting to sew a pair of ankara pants for a while but I'm too lazy to make them from scratch. 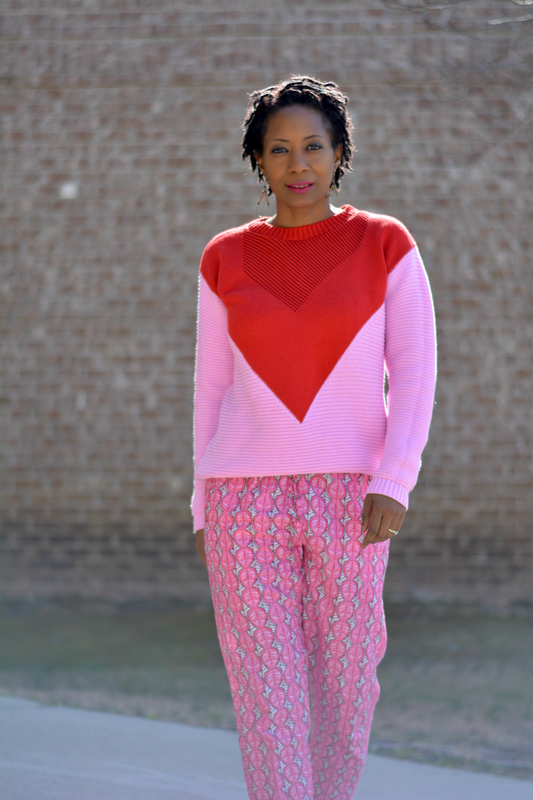 I opted to refashion a a pair of basic drawstring pajama style pants that I already owned. All I had to do was cut some length and take out some of the fullness. I have a pair of ankara pants that I normally wear around the house to lounge in. They're from the Unclaimed Baggage road trip adventure. They were big before weight loss and they're extra baggy after weight loss. I am still working through my closet clean up and these pants fell into that grey area. I don't want to give them up. Pink pants don't come along every day. I don't wear them outside of the house either -- too big and shapeless. I decided to turn them ankle length cropped. I think that's the perfect length for me. I also wanted them more in the realm of athleisure instead of pajama pants so I tapered the pant legs a little bit too. 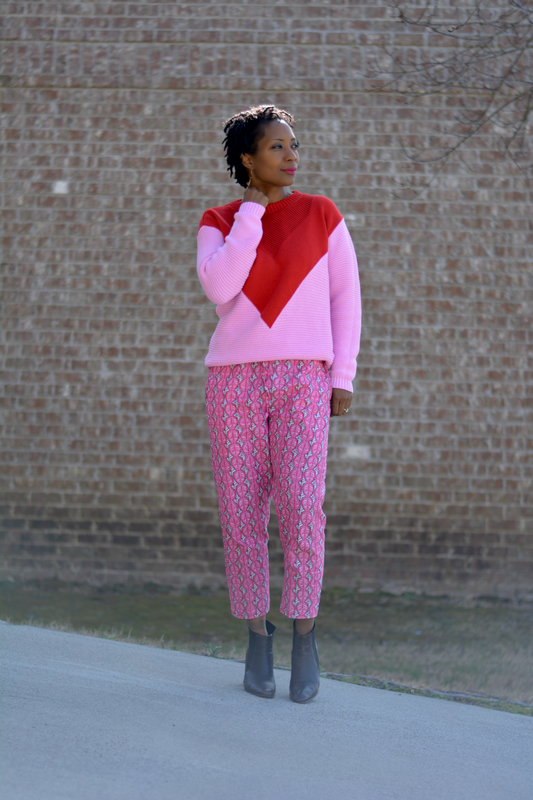 pajama pants - I used african print pants for this one but scrubs in a fun print would also be a nice substitute. Instructions Step 1: Try pants on and mark pants just below ankle. You'll need a little room to finish the hem. Cut the pant length along marked edge. Step 2: Place a pair of tapered pants on top of the cut pants matching them up at the crotch. Working with the inside pant leg, mark the new seam line. Step 3: Open up the seam and cut about ¼" away from the new seam line. Step 4: Fold the pant leg with the opened up seam over the other pant leg. Cut it to match. Sew the new seam lines and finish the hem. 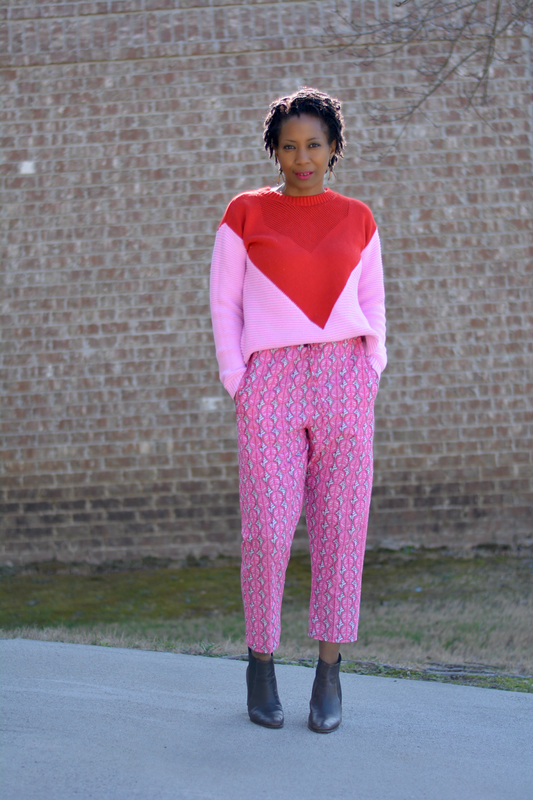 I figured I would give my turtlenecks a rest and opted for a neck barring sweater in vibrant pink and red hues. The DVF ankle boots were just the right height to show off the crop and leave a little ankle exposure.